When The Spaniard received a letter saying he had been approved for his permanent residency in Canada he was informed he had to leave the country to officially ‘land’ as part of the process. Since you need to stay in the country once you land until your card arrives in the mail, he wanted to get the process taken care of immediately so he could get home in time for Christmas. But, with the Canadian dollar in the tank and flight prices high, I voted against flying to the US for a weekend and instead convinced him of a good old-fashioned road trip to the Montana border and back. After spending the night in Calgary on the Friday, where we took advantage of a free room at my sister’s place, we set off west of the city in search of highway 22 – also known as The Cowboy Trail. The line was long but since we were willing to sit at the counter we seated within 20 minutes. The portions were certainly southern style – but I managed to polish my gluten-free girl friendly bun-less Alberta beef burger and fries. The Spaniard opted for the ‘smaller’ portion of the Cody scramble. We popped into Alberta’s first craft distillery – the Eau Claire Distillery, which is next door to the cafe. I had bought my father a bottle of their artisan three point vodka for Christmas – he was a fan of the farm to glass flavour. Tastings are available Wednesday to Sunday, but there was no room in the belly after the lunch and not an ideal activity for a road trip. We had spotted Ben’s thrift shop on our way into town so we walked backed to have a look around. The Spaniard scored a wine rack for $2.50 and I got square cake pans for $1.50 – oh how I love small town thrift shops. 2 km down the road is Black Diamond where we took a look in Cool Hand Luc’s Treasure Shop – but the prices were a bit high for my bargain-hunting blood. We did find some cool records to listen to while we browsed. Check out this figure skating outfit was from the closing ceremonies of the 1998 winter olympics in Calgary! A few doors down we walked into the famous Black Diamond bakery so someone could have some gluten. Among so many choices – The Spaniard settled on an icing-topped cinnamon bun. I skipped the glutenfest and we made a stop in at the Hitchin Post in High River. Seriously, one of the best banana splits I have ever had. The sugar rush kept me attentive for the next few hours as we drove to the border. Some quick paperwork and a u-turn at American customs and we were back in Canada. 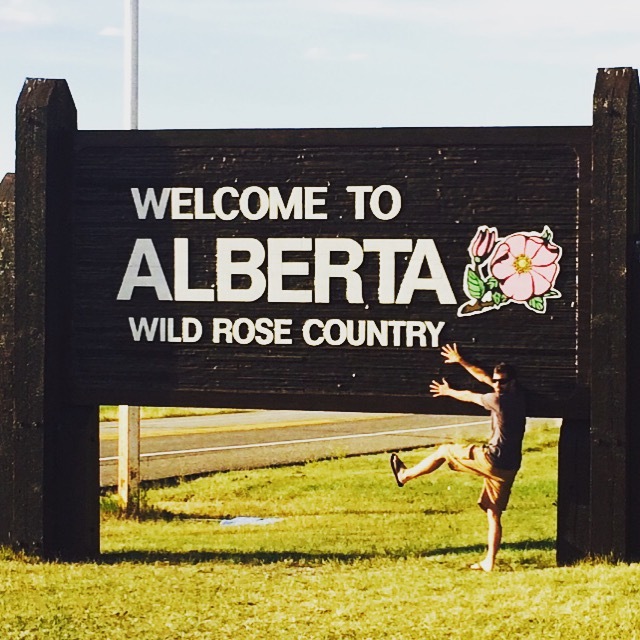 Took less than an hour with immigration but once the paperwork was filed – The Spaniard had to pose for the obligatory ‘Welcome to Alberta’ photo. Someone was supposed to take a photo of the windmills – but instead I have a hairy foot picture. We stayed overnight in Lethbridge where our motel had a waffle maker at our complimentary breakfast – very impressive. We drove west so we could visit the UNESCO world heritage Head-Smashed-In Buffalo Jump. An informative video re-enacted a method of hunting practiced by native people of the North American plains for nearly 6,000 years. Because of their excellent understanding of the regional topography and bison behaviour, the native people were able to hunt bison by stampeding them over a cliff. They then carved up the carcasses and dragged the pieces to be butchered and processed in the butchering camp set up on the flats beyond the cliffs. The museum is built into the cliff and once you make it all the way to the top for a lookout of where the bison stampeded off the cliff to their death. One incredible view with thousands of years of history. We jumped back in the car for our long ride back to Edmonton. We stopped in Nanton for a picnic lunch and to browse some of the incredible antique shops. If only my head wasn’t so big, I would have walked out of that town with 10 vintage ladies hats. We got back in the car and drove to our next stop, the famous Gopher Hole Museum in Torrington. All together we did over 1300 km from Edmonton to the Montana border and back in my little Honda. As The Spaniard continues to fill up stamps on his Alberta passport – it is time for a car wash!